Here is my Chart of the Day Friday summary (just 4 this week!) covering markets, technicals, sectors and stocks I am interested in. You can find these on Linkedin too, so please connect with me there for daily content updates. You can click on each chart title below for more information. 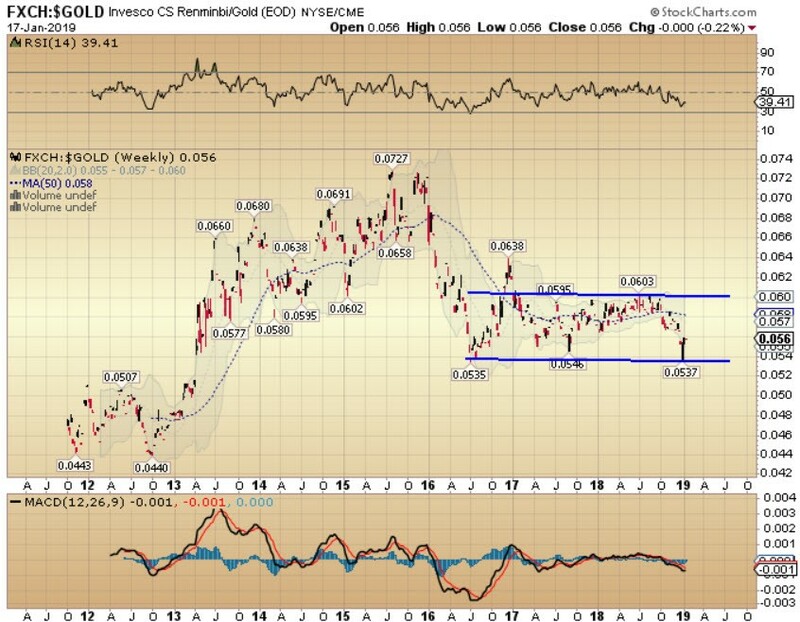 Renminbi Volatility versus Gold - Last October in ‘As Good As Gold’ I referenced China’s long-term intention to replace the United States as the world’s global superpower. China has a lot of work to do. As part of the process, China needs to provide an alternative to the US dollar as the world’s reserve currency. China is making some progress in this regard. Since 2016, renminbi volatility versus gold has declined sharply and in recent weeks, the currency has rallied sharply relative to gold. Sterling Performance Mrs. May - Sterling has been consolidating between €0.82 and €0.94 for over 2 years following a greater than -30% decline in the currency versus EUR in 2016. Today, the UK parliament votes on Teresa May’s Brexit plan. Odds are that May will lose the vote. 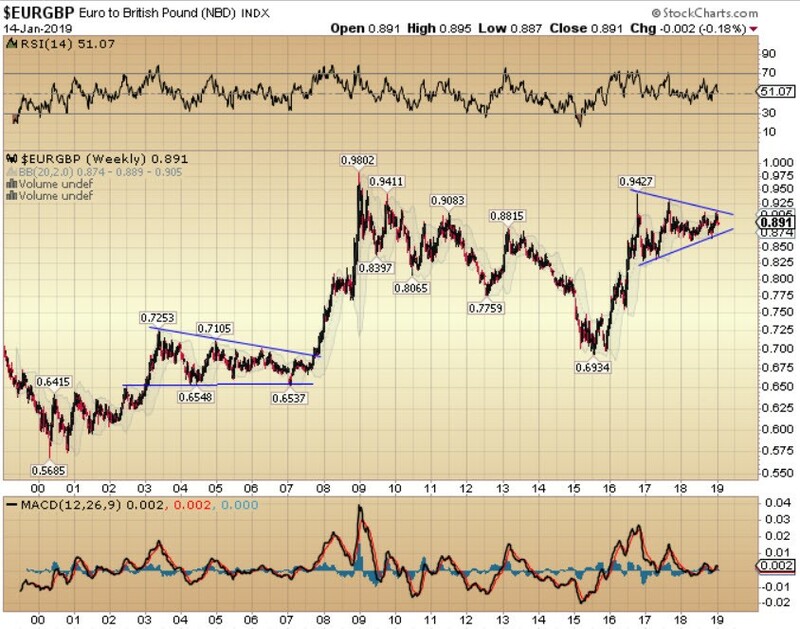 If she loses by a significant majority, watch for $EURGBP to break out higher from the triangle consolidation as GBP resumes its decline versus EUR. An unexpected vote in favour of May’s plan would see a sharp rally in GBP and a break lower from the 2-year consolidation. While it is not possible to predict the outcome of this afternoon’s vote, I can assign a much higher probability to the longer-term direction of $EURGBP following the break higher or lower from the pattern below. Bearish Trend Still in Force - Regular readers will know I rely heavily on technical analysis and reading the charts to assist me in forming my views on global markets. It has definitely helped me navigate the volatility of the equity markets in recent months and steer clear of the downdrafts. Many were taken aback by the sharp -20% plunge in global equities in December. However, a glance at some of the technical charts would have been enough to warn investors of the broad deterioration that was taking place beneath the surface. The information was in plain sight for those to cared to take a closer look. 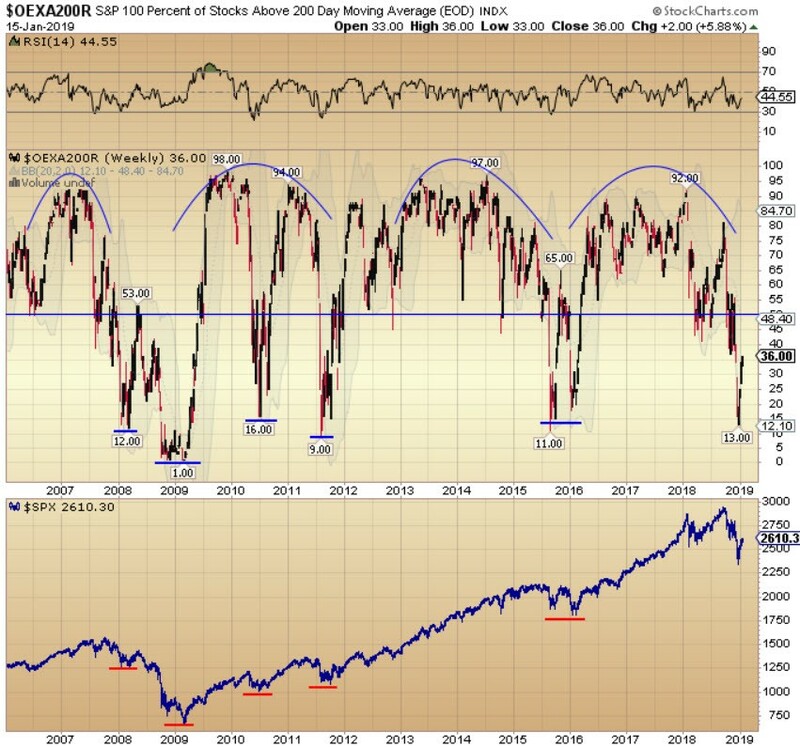 Oversold Rally - We have had the sharp correction,. Now it is time for stock markets to rally. I am watching closely to see how far they can juice the market higher before heading into trouble. The relative strength and momentum indicators are oversold but still in a sharp downtrend. 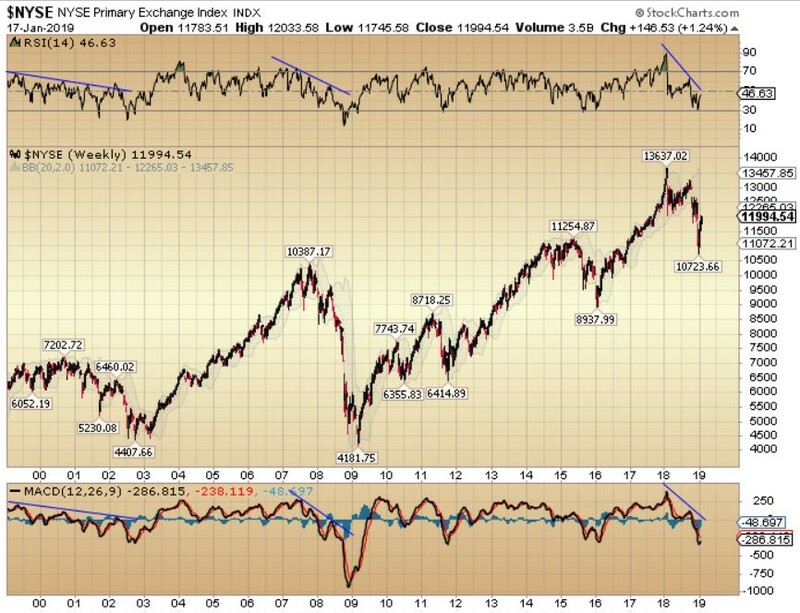 My guess is that stock markets need to re-test the lows at a minimum before a more sustained rally can commence. Today is options expiration in the United States, so often prices can get manipulated in the short-term. The next few weeks should provide meaningful information as to the health of the stock market.